Father Bryan was born on June 19, 1933, in Brentwood, New York, the son of George and Rita (Fearon) and brother of former Redemptorists George J. and Robert J. Bryan. He was the nephew of Father Robert Fearon, C.Ss.R. Baptized (July 2, 1933) and confirmed (May 27, 1945) at St. Anne’s, Brentwood, he attended the Redemptorist Minor Seminary of St. Mary’s College in North East, Pennsylvania, from 1947 to 1953. He professed temporary vows on August 2, 1954, at St. Mary’s, Ilchester, Maryland, and perpetual vows on September 2, 1957, at Mount St. Alphonsus, Esopus, New York. He was ordained to the priesthood on June 21, 1959, at Mount St. Alphonsus. From 1960 to 1961 he taught at St. Mary’s College in North East and undertook graduate studies at the Catholic University of America, earning a master of arts degree, and was part of the community at Holy Redeemer College in Washington, D.C. From 1963 to 1970 he was a professor at St. Alphonsus College in Suffield, Connecticut. From 1970 to 1971 he served as a parochial assistant at St. Joseph’s Parish in Rochester, New York. 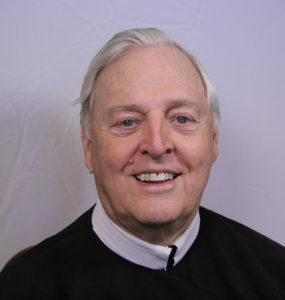 As a member of the Province Mission Band, between 1971 and 1972 he was stationed at Notre Dame Retreat House in Canandaigua, New York, and until 1975 was again a member of the community at Holy Redeemer College. From 1975 to 1981 he served as rector of St. Clement’s Mission House in Ephrata, Pennsylvania. Between 1981 and 1987 Father Bryan served as pastor of St. Clement’s Church in Saratoga Springs, New York. From 1987 to 1993 he served as rector and director of San Alfonso Retreat House in West End, New Jersey. From 1993 to 1997 he served St. Peter the Apostle Parish in Philadelphia before undertaking a one-year degree in pastoral counseling at Berkeley Divinity School. In 1998 he moved again to St. Clement Mission House in Ephrata and gave missions around the country until 2017, when his health forced him to retire. The onset of illness forced a move to the St. John Neumann Residence at Stella Maris in Timonium, Maryland. Viewing begins at 10:30 a.m. Thursday, March 28, 2019, at the Stella Maris Chapel, 2300 Dulaney Valley Road, Timonium, MD, 21093. A funeral Mass will be celebrated there at 11 a.m., followed by lunch. The wake is set for 7 p.m. Friday, March 29, at Our Mother of Perpetual Help Church, 320 Church Ave., Ephrata, PA 17522. Mass will be celebrated at OMPH at 11 a.m. Saturday, March 30.